Now what is a Faculty Information System and what does it do? 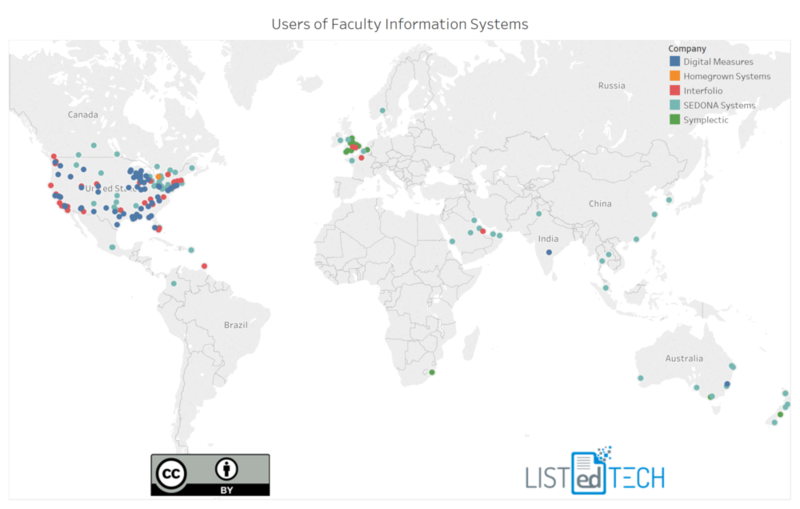 Faculty Information Systems are software solutions that allow easy managing, sharing, updating and accessing information regarding an institution’s faculty members. This system is essentially a database of every professor’s career development be it research, teaching, credentials, articles, etc. For decades, homegrown systems were developed and maintained locally. Today, web-based software solutions are being developed to keep all information organized, safe and in real time. Almost all the companies mentioned above are dedicated exclusively to their Faculty Information System. Since we have only been gathering information about this product category for a few months, we are purposely not showing market share for fear of not representing the market accurately. Most of the users we found had been using a homegrown system to do all or partial tasks that are now being done by FIS; anything from modified content management systems to excel sheets were/are used. As you can see from the map, users are mostly located in what we would refer as western countries. Basically all users of the systems (98%) are 4-year institutions. Sixty-seven percent of the FIS systems we have in our DB have been implemented in the last six years. This is a fairly new system on the universities’ radar. Send us your thoughts and other systems you know that fit this category.